For those of you who've read the Creatus Series, get ready for this new adventure full of romance, suspense, and fantasy. And this week only, register to win the eBook the day it publishes! Sirena stared at her image in the mirrored wall of her glamorous suite. She’d sold everything she’d accumulated in the last ten years to come here. For one last week to be free. To feel the sand beneath her feet, the sun on her face, and the breeze as it brushed against her skin like a lover’s kiss. Not that she’d felt that kind of kiss in a long time, but she remembered what it’d felt like the first time she had. The first time he’d kissed her. The man she’d once loved. The man she’d moved to the congested streets of New York to be with. Her father had warned her about men like him, and he’d been right. Merely months after she’d moved to New York, the man she’d thought had loved her moved to another bustling city and had made it clear that she shouldn’t follow him. She could have forced herself on him, but she wouldn’t…couldn’t. What good would it do to force someone to love you? Sirena pulled her long blond hair over her shoulder and weaved threads of silver through each strand as she braided her hair. Her father had always liked when she’d done this, said she looked like the princess she was, the queen she’d eventually be. But she’d run away from her heritage…out of fear. “What you paid me will feed my family for months, so I’m much obliged.” Tia worked her slender fingers through the braid, loosening the strands, and then started over from scratch. When she finished, she laid the long woven tress over Sirena’s shoulder again, then walked toward the closet. Tia reached into the closet for the gown Sirena told her she’d wear tonight. The organza fabric shimmered as the young woman swept the dress around in a circle, holding the sweetheart neckline to her chest. Tia held open the dress so Sirena could step inside, then smoothed it up over her hips and bust. She zipped up the back and then stepped back as Sirena stared in the mirror again. She did look like a princess. That time had passed, though. She’d given up her crown. A tear threatened to escape, but she lifted her head and blinked it away. Tia would be hurt if she ruined her makeup. “Now, turn so that I can look at you,” Tia instructed in her charming native tongue. Sirena turned, then lowered herself into a curtsy, since Tia loved to treat her as though she were royalty, even though she’d never breathed a word about her previous life. With one hand on Tia’s shoulder for support, Sirena slipped into the sleek satin shoes and pulled up the tiny zippers at the back of the heels. 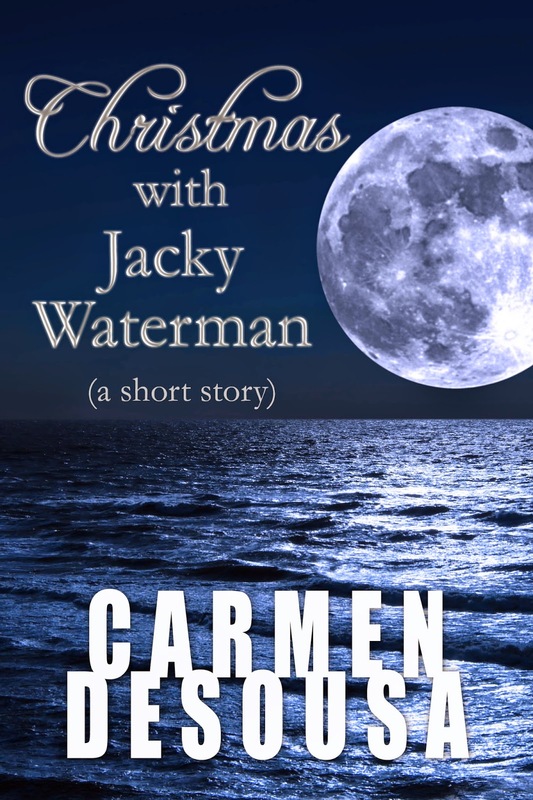 If you'd like a little more info on Christmas With Jacky Waterman, please visit my Amazon Page.